After exploring Russia with "Promenades Impériales" and Japan with "Chant du Printemps," the Chaumet presents a third and final stop on its "Les Mondes de Chaumet" high-jewellery tour with "Trésors d'Afrique." This latest chapter heads to sub-Saharan Africa, soaking up its multiple inspirations, from arts and crafts to femininity, sovereignty, symbols, and nature—all of which gives rise to a colorful high-jewellery collection. 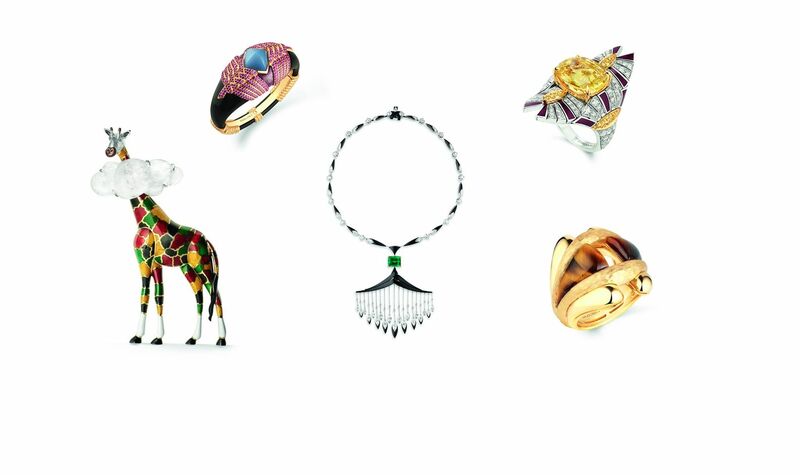 This new jewellery offering, inspired by sub-Saharan Africa, comes in five distinct parts. The first, called "Ronde de Pierres," is inspired by the beaded necklaces worn by the Dinka people of Sudan and the Maasai people. These are evoked with beads of red spinel, emerald, sapphire and mandarin garnet, contrasting with black spinel on black rhodium-plated gold and diamonds. The "Cascades Royales" line is inspired by the necklaces and headpieces worn by Rwandan queens and Kenya's Samburu brides, and features Muzo emeralds, sculpted onyx and navette diamonds, while the patterns of Kente cloth from Ghana and Kasai velvet are channeled in the "Terres d'Or" line, featuring pigeon-blood rubies and yellow sapphires. African arts and crafts are celebrated in the "Talismania" line, made from ebony, hardstones, onyx and gemstones. Finally, the "Espiègleries" line sees Chaumet join forces with the Kenyan artist, Evans Mbugua, who designed six animal brooches: an elephant, a lion, a zebra, a monkey, a giraffe and pink flamingoes. One of the most spectacular pieces in this latest Chaumet collection is a convertible necklace in white gold and yellow gold, set with a 7.15-carat emerald-cut emerald from Muzo, Colombia, as well as nine navette diamonds (0.45-0.80 carats), onyx and brilliant-cut diamonds. "Trésors d'Afrique" also includes four watches, including two Tourbillon models.